definite 'go to' stamp - love it! 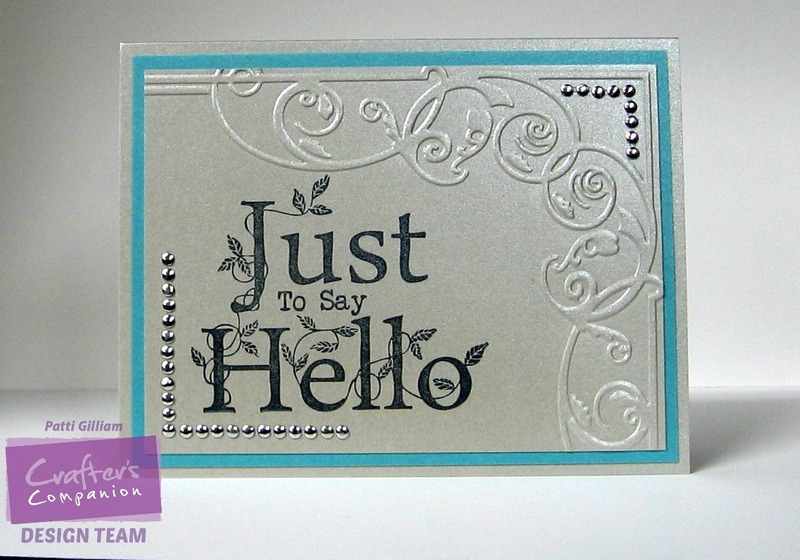 what a gorgeous cardstock it is for dry embossing! This card would be pretty made up for a wedding or anniversary, as well! Thanks for dropping by today - hope you're having a great Monday! Very pretty card Patti! It would brighten up any one's day. Love the shimmery cardstock. "Simply" stunning, Patti. I love that shimmer paper, they sent me a package when I ordered something else, it is lovely. And that embossing folder is so pretty to. What a beautiful card and sentiment. That is so beautiful and elegant looking. Lovely embossed design on the card too! OMGosh--stunning! Love that fancy corner. Pure elegance, Patti! Love it! Stunning - love the shimmer cs and the message is perfect. Very nice job. Very, very pretty, Patti! The stamp and the EF are so beautiful on that shimmery CS. What a beautiful card. I love that sentiment stamp, the dry embossing and the shimmer. Truly, an outstanding card my friend. What a KNOCK out!!! Woo. The shimmer card with embossing in the corner and the perfect large sentiment with bling - thud!!! Someone is going to be speechless when you give this!!! This is so wonderful Patti. The embossing is exactly the right thing to go with the stamp. This is just so beautiful! I love the embossing in the corner! This is a stunning card, that shimmer is fabulous!